Serving suggestion: Shake well before drinking, refrigerate for optimum taste. Storage Condition: Keep in a cool dry place. Settling is natural. May also contains sulphites, gluten, peanuts, soybeans, milk and tree nuts. 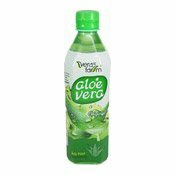 Ingredients: Water, Aloe Vera Juice & Pulps (6%), Fructose, Sugar, Honey, Apple Juice Concentrate, Acidity Regulator (E296), Stabiliser (E327), Flavouring, Antioxidant (E300), Stabiliser (Sodium Metaphosphate [Sulphites], E415, E418).